Hanoi (AsiaNews) – Goon squads went into action last night in Hanoi. About a hundred thugs raided the prayer vigil held by Thai Ha faithful under the indifferent eye of some 500 police agents—they destroyed a chapel, sullied a statue of Our Lady with motor oil and proffered threats against the people who were praying. The same thing had happened at night on Friday when another bunch of thugs attacked the faithful, ransacked St Gerard chapel and an outdoor altar, destroying statues and images despite a police presence. “The attackers were shouting slogans, calling for the murder of the archbishops and Thai Ha superior, Fr Matthew Vu Khoi Phung,” said the Redemptorists. Thao was particularly enraged by the protest letter the archbishop sent to Vietnam’s President Nguyen Minh Triet, its prime minister and the head of the religious Affairs Commission in which he “made false accusations against the city government” according to which the latter had violated the law. Chairman Thao accused the archbishop of challenging the state with claims that Catholics “had a right to use very means to protect our property.” Making matters worse, the used loud speaker to read the letter. Hanoi authorities thus chose to use violence to bring to an end the peaceful demonstrations that Catholics have been conducting to get back two pieces of land that had been illegally seized from them, namely the compound of the former nunciature, near St Joseph Cathedral, and the land that belonged to Thai Ha Parish and the Redemptorist Monastery. In a country where the government is passing laws and getting involved in campaigns against corruption Hanoi authorities were planning to use the seized land for public use as a restaurant (former nunciature) and a garment factory (Thai Ha). A campaign of disinformation, threats, arrest and now violence has been the response of the People’s Committee to this demand for justice. As late as yesterday official news agency VNA was quoting Thao dismissing the Church’s claims to Thai Ha as “baseless” since the Church supposedly had donated it. By contrast, the Redemptorists have denied the chairman’s claim saying that they have all the necessary title deeds to the properties whereas all their requests for the People’s Committee to show the documents about the alleged “donation” have gone unheeded. 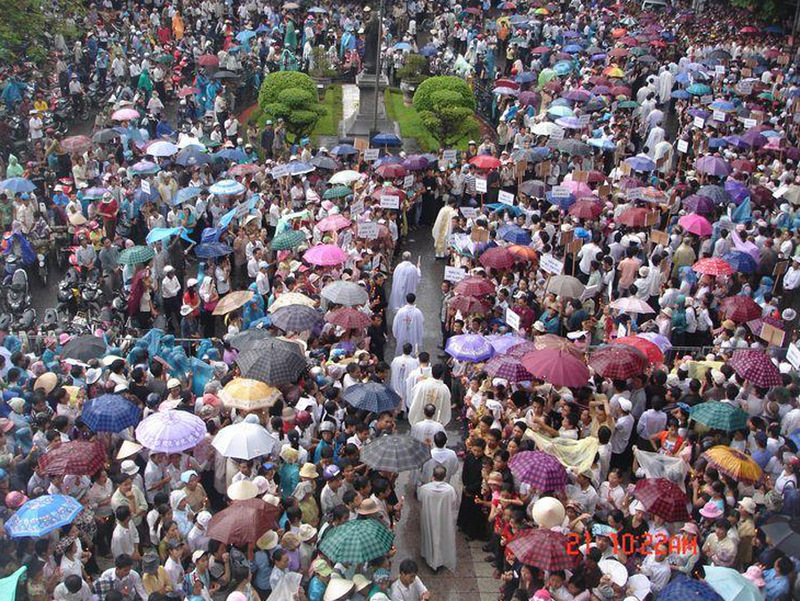 Catholic reaction to the planned use of their property has been peaceful; however, their demonstrations have become the largest since the Communist took over in 1954. The issue has not remained confined to Hanoi as tens of northern bishops have travelled to the capital to show their solidarity. Yesterday Mgr. Joseph Dang Duc Ngan from Lang Son and hundreds of priests from Ha Nam, Ha Tay and Nam Dinh led a march of thousands of Catholics (see photo) to the gates of the former nunciature. But they failed to get close to the place. Since Friday the compound has been surrounded by police; barriers have been set up to deny access to the cathedral and archbishop’s residence. Anti-riot squads have been deployed in full gear with dogs and equipment to hamper telephone communications. The area is under a virtual state of siege. Since Friday demolition work has been underway inside the area of the former nunciature which the People’s Committee now wants to turn into a public park with a library. Lastly today the Federation of Vietnamese Catholic Mass Media launched an urgent appeal on behalf of the human and religious rights of Vietnamese Catholics. The federation includes several religious publications based outside Vietnam. In the meantime in Hanoi, the cathedral’s bells are still tolling, calling out for help.